﻿ Curried Stuffed Eggs - Merwanjee Poonjiajee & Sons Pvt. Ltd.
Peel and halve each egg lengthwise. 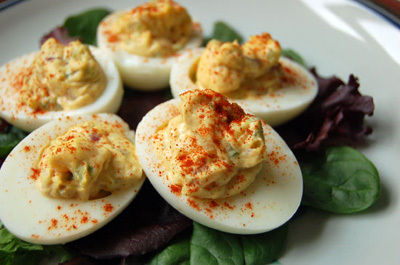 In a food processor, process yolks, chutney, mayonnaise, curry & Tabasco until smooth. Use a pastry bag with a star tube to pipe yolk mixture into hollowed whites.